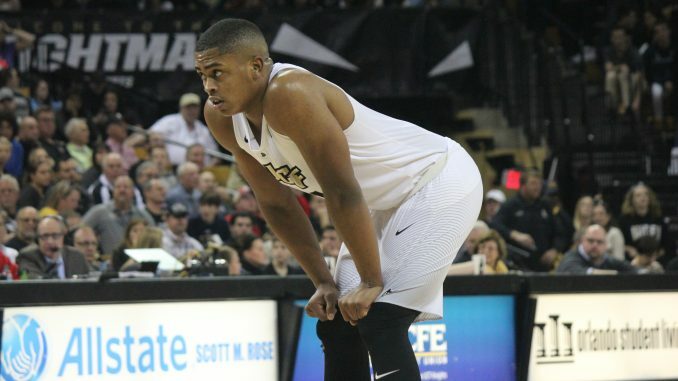 The UCF Men’s Basketball team dropped its third conference game in its last four, as they fell at No. 17 Wichita State 81-62 Thursday night. The Knights (13-7, 4-4 AAC) got senior A.J. Davis back for the game after he sat out Saturday’s game against USF with an ankle injury. After playing much of the first half close, Wichita State (16-4, 6-2 AAC) jumped out to a 16-point lead with under three minutes to go in the half. Junior guard B.J. Taylor got the Knights back in the game, scoring seven straight points as part of a 11-3 run to end the half, bringing the halftime deficit to 39-31. The hot end of the half did not carry over to the second half, as the Knights were never able to get closer than seven points. Wichita State, which led wire to wire, was able to extend its lead to as much as 21 in the second half. UCF struggled on offense, as the Knights shot 36 percent from the field and had 10 turnovers. They also continued to struggle from the free throw line, finishing 11-21. Taylor, in his third game back from injury, struggled on offense, scoring 12 points on 4-15 shooting. Junior Dayon Griffin led the Knights with 15 points. The defense missed center Tacko Fall, who is out for the season, as the Knights gave up 80 points for just the second time this season. The Knights are back at home on Wednesday night against UConn.